While attempting to get back in the yoga game last week, my focus became a little skewed. Sometimes, you can look at a picture of something hanging in a museum or see a person doing some sort of activity and say, "Pshhh, that's easy, I can do that." That is what I was thinking last week as I scrolled through Tumblr and saw my fellow bloggers posting pictures of themselves doing some yoga moves. However, when you actually set out to do what you're seeing someone else do, it's not really the same. After skipping out on yoga for a couple of months, I was inspired to get back on the mat after following a couple of yoga blogs by doing a yoga challenge. Previously, my practice was a combination between yoga videos from Tara Stiles and a beginner's sequence from B.K.S. Iyengar's yoga bible, Light on Yoga. I tried some old poses that I knew from these yoga series' and new poses from the yoga challenge. It was hard to do a simple triangle pose and other standing poses from the beginner's series, and I couldn't even dream of doing some of the arm balances from the yoga challenge. It was difficult and disappointing. Part of my failure to do some of these easy poses was that I haven't done yoga in awhile. The other, larger part of the problem was that I was trying to do moves that were at an intermediate/advanced level that I just wasn't ready for. I've always enjoyed challenging myself, but this challenge in particular was different. Not because I couldn't do the challenge, but because of the motivation behind me wanting to do try it out. I wanted to prove to people that I could do certain poses. 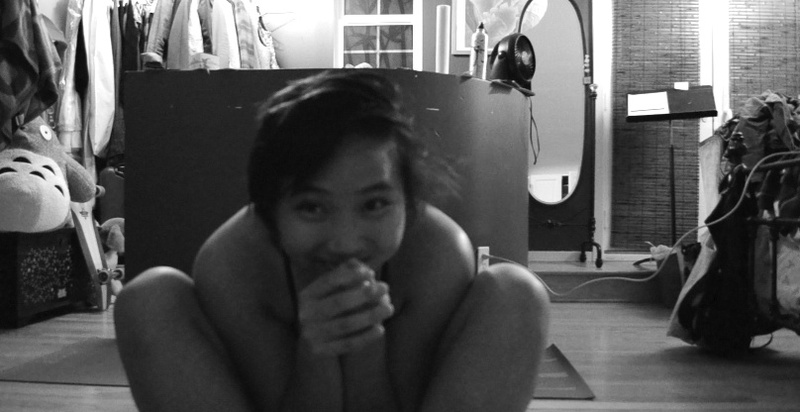 I wanted to have cool pictures on my Tumblr and be bendy and graceful. I realized that I cannot have cool pictures and be bendy and graceful like other people. I can only be me. Something that I've been constantly reminded of when I watch Pilates videos by Cassey Ho of Blogilates is that everyone is on their own fitness journey. In the same way, I'm on my own yoga journey, I'm on my own relationship journey, I'm on my own career path, and so on. I don't want to sound defeatist or sound like I'm limiting myself. However, I can really only do what's within my physical and mental limits - for the time being. But I can always stretch those limits. I can still go for those challenging yoga poses, but I have to remember that it won't look like what other people are doing. Yoga is about practice, not perfection. My practice will never be perfect the first, second, or twentieth time. I can also attempt a career in journalism and attempt other challenging life stuff, but I can never have a career like other writers or follow the same life path as another person. I can only ever be me. So why beat myself up if I can't be like someone else?